This post is a puzzling one for us as we saw it last year, and were very impressed by the potential of this technology. Compared to the original Wind Propellers we have all grown to love or hate, they promise significant improvements. Our question is why, if this technology works, more is not been said in the Papers and the News and Country Leaders are not looking at this seriously?. These are some of their claims and stats: Less than 2¢ per kWh • Less than 5 year payback • Less than 2 mph wind speeds (to start producing electricity) • 50% less operating and maintenance costs • 43% less capital expenses • 90% less land use • NO harm to humans, animals, or birds. See more information in the article. If you want even more in depth information, you can visit Sheerwind's website. If you go to their site, please come back to us and let us know what you think of it and why, if it does work, not more is being done to publicise this potentially fantastic system. Please leave comments at the end of the article. Have a look at this video, for the basic concepts of how it works, more below. 90% less, land use. Towers used are shorter and smaller and have no moving parts, meaning lower installation and maintenance costs. Because of its compact structures it is much easier to blend with its environment. This reduces noise, both low and high frequency and eliminates the shadow flicker issue. The fact that it does not interfere with Radar Systems and that they produce electricity with just 2 mph winds, allows this system a greater choice of sites, it can be installed in. The enclosed turbine-generator system means less downtime and reduced costs associated with failure and repairs. Because turbines are installed inside the INVELOX unit, they are not subject to harsh temperature variations or icing. By channelling wind through a passage it creates a jet effect, which increases velocity and lowers the pressure. This process creates kinetic energy. 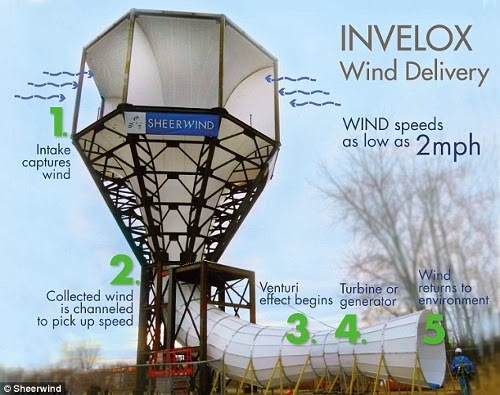 Very interesting spin on wind power. Seems as thought it would be much safer for birds and such, but also takes up more space on the ground. This is a great concept and I will love to see how it develops from here.